For many of us, the ebook reader was the next best thing to happen since Gutenberg’s printing press. The printing press made books widely available, and the ebook reader conveniently shrunk the same to such compactness that we can carry a thousand of them around wherever we go without discomfort. Such a concept would have been fantastic for someone born in the 16th century, but nevertheless, the idea did cross their minds—especially the mind of Agostino Ramelli. Agostino Ramelli was an Italian military engineer. As a young man he served under the famous Italian warlord, the Marquis of Marignano, and became trained in mathematics and military engineering. Ramelli had a knack for solving mechanical problems, and as his reputation grew he left for France to serve under the Duke of Anjou, who later became King Henry III. When Ramelli successfully engineered a mine under a bastion and helped breach a fortification during the Siege of La Rochelle, he became very popular with the commander, the Duke. Agostino Ramelli didn’t build a lot of machines, but he had a storehouse of ideas aimed at solving everyday problems, such as how to mill grains, or haul heavy objects, excavate a ditch, or defend a city. All his solutions involved some kind of a mechanical device. In 1588, he collected nearly two hundred of his best ideas and published a book entitled Le diverse et artificiose machine del Capitano Agostino Ramelli, or “The various and ingenious machines of Captain Agostino Ramelli.” The book contained 195 full-page engravings accompanied by detailed descriptions of each mechanism in both Italian and French. Ramelli devoted half the book to various methods to raise water, such as water pumps, water wheels and wells. Other designs included cranes, bridges, fountains, cofferdams, screw jacks, hurling engines, and so on. One of the most famous designs from this book was the bookwheel. The bookwheel resembled a Ferris wheel typically found in amusement parks, with the riders replaced by slanted reading desks. 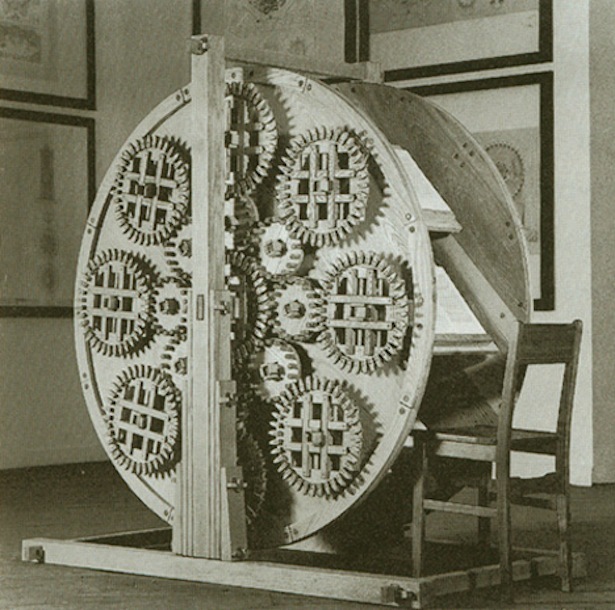 A complicated arrangement of gears called epicyclic gearing, that had only previously been used in astronomical clocks, ensured the lecturns over which the books were laid open remain at the same angle no matter the wheel's position. 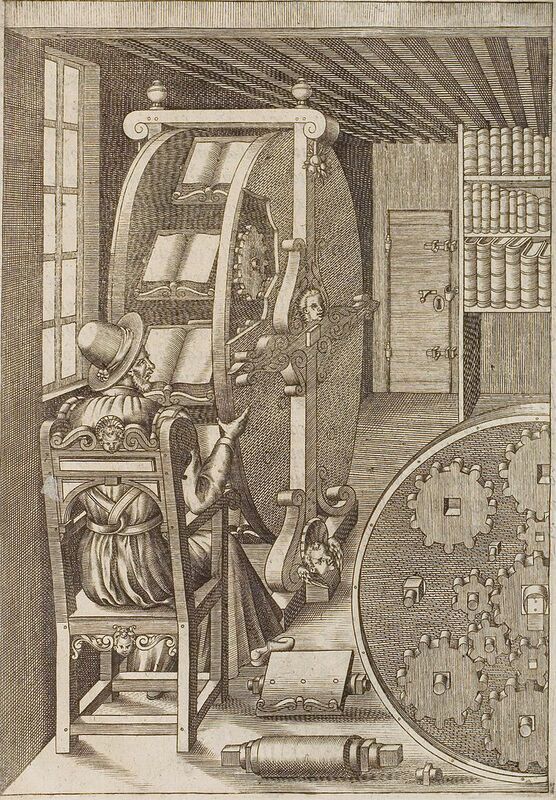 The seated reader used either hand or foot controls to rotate the wheels and bring the desired book into position. According to Witold Rybczynski, gravity would have worked just as fine in keeping the lecturns level, as it does with a Ferris wheel, but Ramelli wanted to show-off his mathematical prowess resulting in an unnecessarily elaborate design. 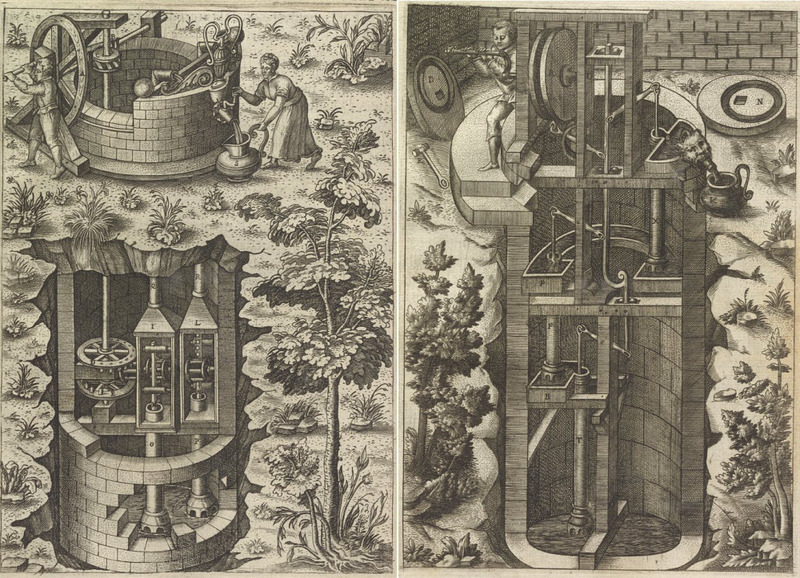 Below are two examples of his overtly complicated machines. Both are devices for the simple task of drawing water from a well. Ramelli never actually built any of the machine, but his illustrations had a great influence on future mechanical engineering. In the 1661 book Theatrum machinarum novum, German architect and engineer Georg Andreas Böckler copied eighteen of Ramelli's plates. Ramelli's influence can also be seen in the well-known works of Grollier de Servière (Recueil d'ouvrages curieux de mathematique et de mecanique, 1719) and Jacob Leupold (Theatrum machinarum, 1724-1739). 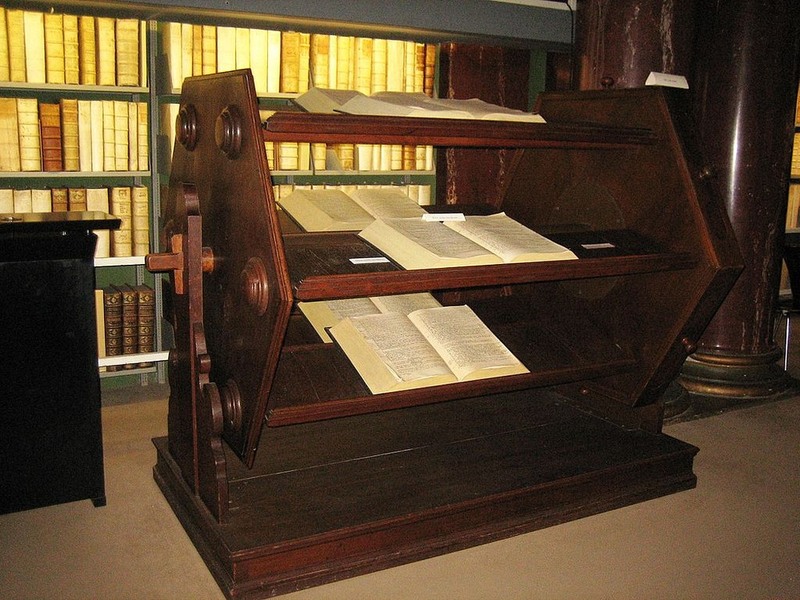 One machine that actually got built was the bookwheel, but generations later in the 17th and 18th centuries. Dozens of bookwheels based on Ramelli’s design were built across Europe. At least fourteen of these survive till today.